Strap yourself in, because this episode is filled to the brim with exposition. Some people seem to have this weird misconception that I think all exposition should be condemned and excised from the story. That couldn’t be farther from the truth. Of course exposition is necessary every now and again. 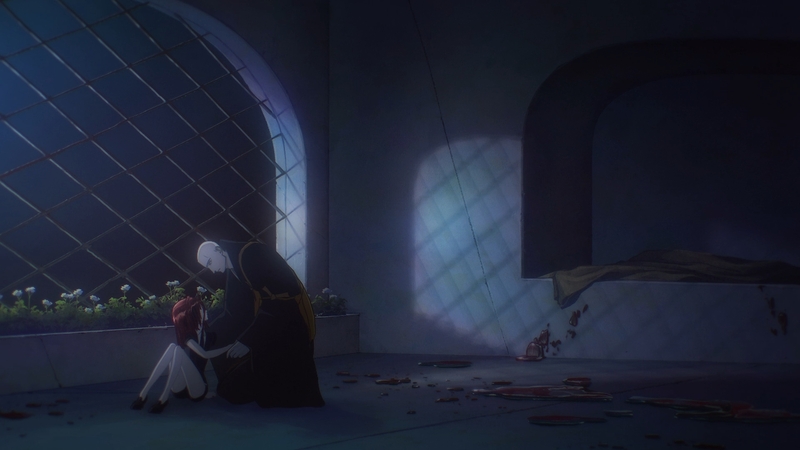 I just also happen to think that, as an anime, Houseki no Kuni has an obligation to at least engage the audience through its visuals. There is little to no action, which again isn’t necessarily a problem. Unfortunately, there is also little to no visual storytelling. For the vast majority of the episode, characters merely stand or walk around as they feed us information. Houseki no Kuni’s universe is intriguing in its conception, and I’m very much interested to learn what’s it all about. I can’t deny, however, that the execution leaves much to be desired. But fine, what are the crucial new bits of information for us to pore over? The now shell-less snail-like creature identifies itself as Ventricosus, the king of the Admirabilis. The Admirabilis once lived in the sea until the Lunarians came for their beautiful shells. Since then, Ventricosus’s people have been imprisoned and rendered stupid by the abundance of the “sweet waters and sands of the moon.” Only by slimming down on the surface does our new snail friend recover her mental faculties. Still, there are more pressing matters for Phos to worry about. They learn that Cinnabar once again played a part in saving them. And yet, Phos still has no idea how to help our mercurial friend out. Ventricosus suggests that the answer would not exist on land. As such, they should head into the sea where Phos will find an individual who very much resembles the gemstones. If the snail can be trusted, they’ll also be killing two birds with one stone, since Ventricosus is so desperately homesick. Phos is far too trusting. Why would you so naively believe anything that Ventricosus tells you? 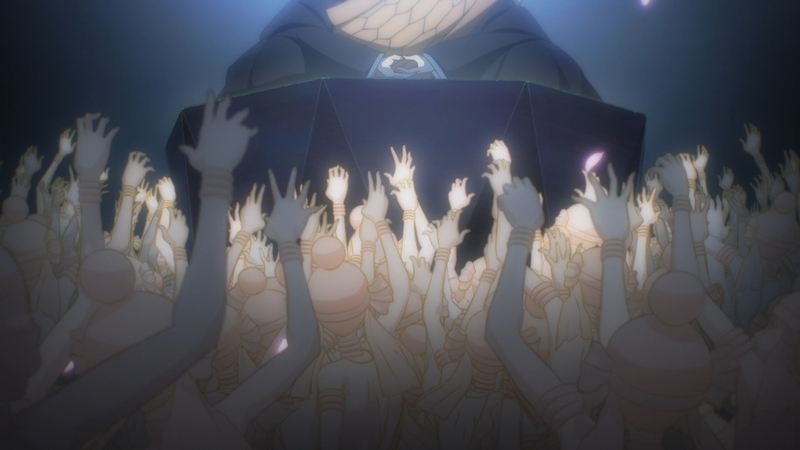 After all, the Lunarians dropped the snail right on the gemstones’ doorstep and left without stirring up more trouble. Wouldn’t you thus be suspicious of Ventricosus’s intentions? Then again, the gemstone is desperate. They’re racing against the clock to prevent Cinnabar’s disappearance. So off to the seas they go. Ventricosus isn’t really lying; rather, she speaks in half-truths. In the sea, the snail reverts to its truer form, which appears to be a pink, jellyfish-like humanoid. So as you can plainly see, Phos did encounter an individual who very much resembles the gemstones. And although the answer they seek may not lie within the ocean, it can perhaps be found on the moon. When Phos lies down on the ocean floor out of exhaustion, a rain of arrows falls from the sky. Ventricosus has lured Phos here in exchange for her brother. What is to become of Phos now? For now, however, there are more interesting topics to explore than Phos’ current predicament. “…death gives meaning to life itself,” says Ventricosus. That sounds like a passive aggressive dig against the gemstones. The snail seems to suggest that Phos and the others have vacuous lives. The majority of them have purposes, sure, but to what end? Take, for example, Red Beryl’s obsession over fashion. They speak as though “[slimming] down the collar by 1/100th of the usual” is a meaningful change. Then what? If we were to live such a life, could we look back on it with any sort of pride? But who am I to judge? I sit in an office for forty hours every week, tweaking an app to increase user retention by 1 or 2 measly percent. That doesn’t sound very different from Red Beryl’s minuscule optimizations. Even worse, Kongo confesses to Phos that he has not yet found a purpose for Cinnabar. In fact, the gemstone had to give themselves a purpose; it was Cinnabar’s idea to become the night watch. We can see, however, that the gemstone suffers alone every single night. Their mental health slowly deteriorates as Kongo continues to slumber in so-called meditation. As empty as the gemstones’ lives might be, a true purpose is at least a step-up from Cinnabar’s truly aimless existence. But if the gemstones’ lives are devoid of meaning, then the Lunarians appear to have it even worse. The moon invaders seem to live for nothing but their base desires. After the sixth comet, humans left for the sea and became soul, flesh and bone. To put it more accurately, humans evolved into three different species. The Admirabilis are the most likely candidate to have descended from the flesh. On the other hand, the gemstones’ seemingly immortal status might suggest that they represent the bone (yes, I know bone is technically living tissue that can die). That leaves only the Lunarians and the soul. If these ancient tales are speaking the truth, why have our souls become so greedy and vain? Why do our souls lust for battle? Perhaps this is what it means to be a human soul in its most distilled form. We may not see ourselves as selfish and warlike, but perhaps our flesh and bone have long served as limiters. After all, there’s only so much we can accomplish as corporeal beings. Our bodies keeps our spirit in check. But if our soul can somehow exist on its own, it would have no such physical restraints. Nevertheless, Ventricosus goes on to say that the soul “[seeks] out the flesh and bones to bring about a revival.” We have yet to see the Lunarians communicate to any discernible degree. For now, the Lunarians only appear superficially human, and this gives me pause. Humans have long associated thought and reason with the soul, but perhaps this is mistaken. Maybe the soul is more akin to a force of nature, a bundle of competing desires that seeks nothing but its own satiation. It does not actually exhibit humanity without the flesh and bone to bind it. What happens to a desire when it is fulfilled? Does it die or does it continues to desire? That’s practically tautological, isn’t it? Desires desire. Otherwise, they would cease to be. Maybe the soul wants to bring about a revival because it lives an empty existence full of unfulfilled desires. Perhaps like ghosts, they are forever restless and envious of the living. — Hm, what is going on with Kongo’s dreams? — The gemstones are beginning to worry, because the Lunarians are appearing more frequently than ever. For the last 2,173 years, the moon invaders would only appear every three sunny days like clockwork. Something, however, has changed their nature. This also triggers a small change in some of the gemstones, too. 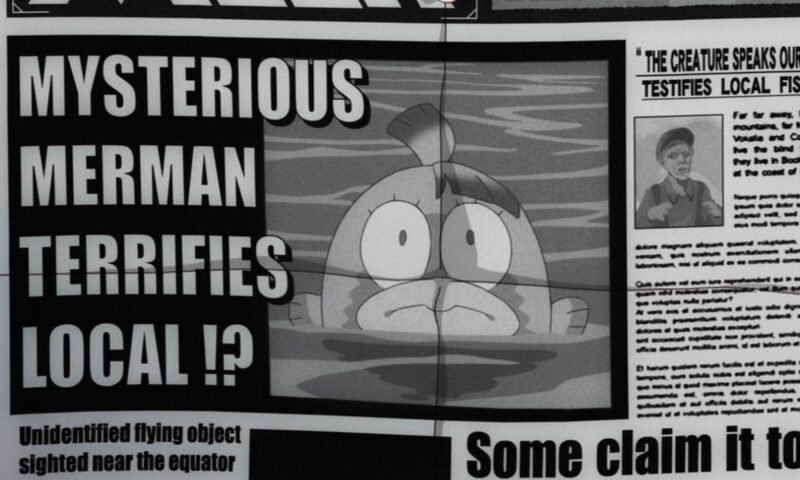 Euclase reveals that they’re actually a bit scared. — They say heat doesn’t affect gemstones. I looked it up just to be sure. Heat apparently can affect the color of gemstones, but I suppose it never gets hot enough in the universe of Houseki no Kuni for these characters to worry. — Not only are the gemstones are genderless, they don’t appear to engage in any sort of sexual activity. So why are they ashamed of their naked appearance? — Phos says that without their resin finish, they would look hideous. But why? Maybe it has something to do with their humanity. They are stones blessed the ability to think and reason. To give off any appearance to the contrary is perhaps an aberration. — Why do snails need breasts? Well, it’s anime, so why do I even bother asking? — Phos says that they are taught to treat every item with care. Bort seems to have little regard for living things, though. Maybe that’s just a Bort thing. — What does it mean for the “bones” to strike a deal with other lifeforms and thereby gain longer lifespans? Speaking of longer lifespans, does this mean the gemstones can and will eventually die? Ventricosus insists, however, that these are just vague stories. You wouldn’t draw hard conclusions from vagaries, would you? 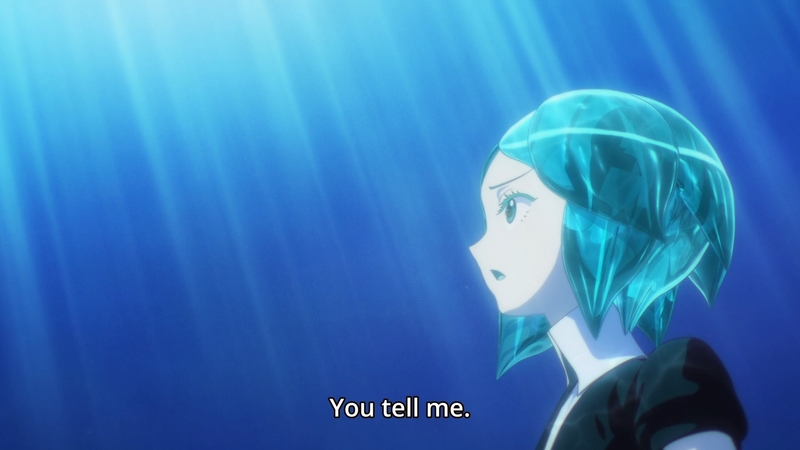 Phos’ behavior this episode was certainly too trusting and naive, but I’m guessing that the motivation for wandering off unsupervised is due to being seen as a nuisance by most of the other gems (with maybe the exception of Diamond), and being driven to thank Cinnabar for not one, but two rescues now. But at least we’ve got more information about this world–even if it was delivered through exposition–thanks to dat betrayal! Excited to see where this goes, because if the Lunarians are kidnapping both gems and snail-folks, could the “revolution” be the return of humanity by reuniting bone, flesh, and blood? Ventricosus’ jiggle physics made me cringe a bit, but I guess it’d make sense that a race descended from human flesh would retain both their sexuality and mortality. Also, I note that a few of the recaps of this series emphasize the sexless nature of the gems, but refer to Kongo as “he.” Kongo’s been around for as long as they have, and is probably a gem, too (as far as we know), so why not “they,” as well? I love your recaps this season, keep it up! Kongo is not a jewel or the slug would have eaten something that could not. The main reason Phos decided to ignore Kongo and went into the sea with Ventricosus is mainly because Ventricosus isn’t getting enough nutrients, so if she don’t get the more nutritious food in the ocean she would do “the dead thing”. That’s why you see her munch on the corals while telling Phos about the lore. Shrug, I’m lazy. And it’s not like they’re specifically requesting me to use a certain pronoun, so I’m not too concerned about it. I think the bone part is more metaphorical than that. I interpret it as being more connected to the aspect where flesh rots away and left with nothing. On the other hand, when an organism dies, bone is still left behind for a relatively long time. Heat can effect minerals, but for most minerals, they are only affect by heat that’s much higher than just the several degrees you get from changing seasons. Regarding Phos and Euclase behaviours and remarks, it’s just culture. There isn’t a reason why human should be ashamed without clothes on either apart from because that’s the norm for the culture. Though it is possible that the gems might have retained some aspects of the human cultures. By striking the deal with another life form, they are referring to “inclusion”. This was explained in episode 1. Although with the poor sub you won’t be able to tell, since the sub ignored it. Just like how it botched the explanations on mineral properties. Thanks for explaining Ventricosus monologue, I swear I dozed off during that scene.